Ray Mears is a man with a passion for the land and those who live closest to it, the world's hunter-gatherers. His heroes also include those whose exploits have not just put themselves on the map but actually made the maps. His latest BBC series follows those Britons who charted the wilderness of the North American continent. Among them is the Welsh-born 18th Century surveyor David Thompson, called "the star gazer" by his native guides, drew the map of Canada using a sextant. Thompson mapped nearly four million square miles (10.3m sq km) of North America. Mears said: "He was the first man to really see Canada as we know it today, and that's a remarkable achievement." 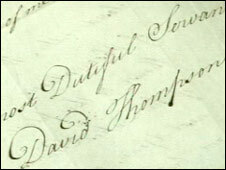 Although Thompson's origins are unclear, it is thought he was born Dafydd ap Thomas in 1770 to Welsh parents. His father died when Thompson was still a youngster and his mother, with the family by then living in London, enrolled him in Grey Coat School near Westminster Abbey, where he excelled in maths. Aged 14, Thompson was apprenticed to the Hudson's Bay Company as a clerk, and put in the care of Mears's greatest hero in this setting, Samuel Hearne. The two men did not get on, as the experienced, navy-trained war veteran Hearne tried to round off the corners of his clever but cloistered apprentice. Mears said: "Hearne knows that to survive in Canada you really have to be able to take care of yourself in the bush. "I think he gave David Thompson a hard time but I don't think unkindly so, and Hearne wasn't as religious as Thompson. "The two definitely clashed. Thompson in later years clearly didn't like Hearne but the strange thing is he carried out Hearne's example, in how he carried out his expeditions and journal writing almost to the letter." 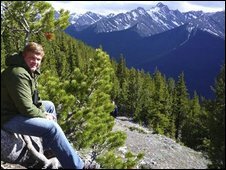 Thomson, in his late teens, eventually found his feet on the Canadian continent. Despite breaking a leg so badly he could have died - he walked with a limp for the rest of his life - he completed his apprenticeship with the Hudson's Bay Company and, cheekily, rejected his reward of two sets of clothes and instead asked for a sextant. The company's decision to grant his request puts Thompson on the path to become one of the most prolific mapmakers of his time. "It's truly astonishing," said Mears. "Just the canoe journeys he made, alone, are phenomenal. One of the things that Thomson, like the other three explorers in the series we talked about, managed to do was, without the benefit of Google Maps, he was able to grasp the scale of the Canadian continent." But Thompson did not just grasp the scale of the country, he mapped it. He used the knowledge and goodwill of first nation tribes to walk, ride and canoe his way across the continent, mapping as he went. 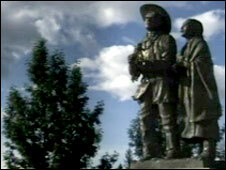 But, as Mears explains, he could not have done it without the first nation Canadians who were his guides and companions. "The 18th Century is interesting," said Mears. "People had a tolerance for explorers working with first nations. "In fact, they could see the wisdom of it. It made sense. There was an open mindedness in the 18th Century that you see disappear in the 19th Century. "So Thomson benefited from this open-minded, outward-looking, entrepreneurial spirit of the age. "It was a time when somebody with the right energy and enthusiasm who showed willing was given an opportunity. And that was very much his case." Thompson went from Hudson's Bay to the west coast, trapping and mapping as he went. He found a crossing for the Rockies, Howse Pass, and followed the Colombia river. He map-making skills were such that when Canada and America wanted to define the border between them, they employed Thompson for the task and did not dispute his recommendations. Yet David Thompson's story is more than just an account of his achievements. It is also a love story. He was married to the same woman for more than 50 years, something of an achievement in his day. Charlotte Small was the daughter of a Cree woman and the daughter of a prominent partner of the North West Company, Thompson's employer after he left the Hudson's Bay Company. But this was no marriage of convenience, said Mears, but a true love match that defied the custom of trappers taking comfort with native women. He said: "He loved her and at this time in history it was quite normal for Hudson's Bay Company members to take what was called a "country wife", in fact it was almost expected of them. "This is a marriage of convenience or an affair of convenience, if you like, where it's good to have an Indian woman because she can mend your clothing, make moccasins and take care of you, because they didn't have the supply of modern gear they have today. "But that wasn't the case either for Hearne or for Thompson, both of them married local girls, who were the loves of their lives and Thompson was to stay with his wife for 50-odd years until he died and she died not long after. "It was very unusual. And it showed the strength of the man. "Canada owes him an awful lot and I think Canada feels that. He is well remembered in Canada. What more can you say? "I think the people of Wales should be very proud of him. Wales can claim him as a hero." 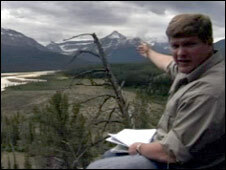 Ray Mears Northern Wilderness is on BBC Two at 2000 GMT on Sunday 23 November.